Many articles on hotel technology trends focus on the cutting-edge, revolutionary developments that perhaps only an elite few hotels could even consider exploring. Exciting as these pieces are, they often neglect the smaller, non-branded properties and the hotel technology trends defining their journey to go digital. A new white paper from Phocuswright has provided the data to help remedy this informational imbalance. Published earlier this year, the report features findings from a 2018 study on the business practices of today’s independent hotels and properties. 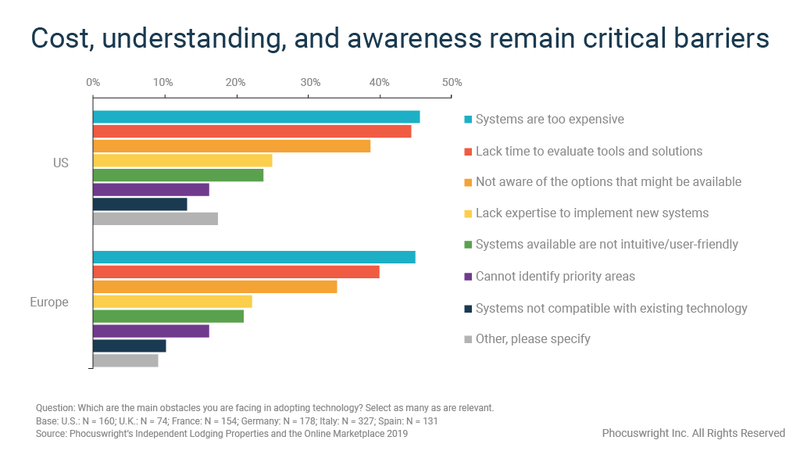 One of the critical topics the research explored was hotel technology — what hotel tech properties are using, what systems they have yet to integrate, and what barriers are still preventing tech adoption in the sector. The study revealed crucial insights into real-life hotel technology trends of 2019, looking exclusively at the independent properties and their current usage of available systems. Key highlights from the white paper can be found below. 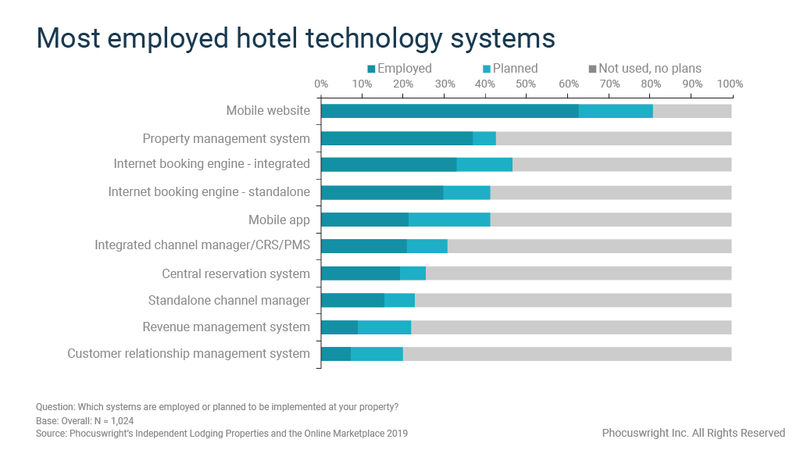 The study found that among independent properties, the only hotel technology systems being well utilized are Internet booking engines and mobile (optimized) websites. In both cases, 63% of respondents already had a system in place. Of the independent properties without a mobile website, 18% stated they intended to use one in the future. Similarly, 24% of properties without a booking engine responded that they planned to implement one. In addition to more websites and booking engines, independent properties are looking to start leveraging other distribution-related hotel technologies in the short term as well. A fifth of respondents (20%) cited plans to integrate a mobile app into their hotel technology portfolio. An anticipated increase in the use of channel management systems (17%), revenue management systems (13%), and customer relationship management systems (13%) over the next two years should also help independent properties grow their direct business, according to the authors of the white paper. Unlike distribution-focused systems, property management systems are severely underutilized among independent properties — a worrying trend that does not appear likely to change in the near future. Of the hoteliers surveyed, only 37% had a property management system in place. A majority of nearly 60% stated that not only did they not currently have a PMS, but that they had no plans to integrate one. The risk here is that not having a modern system can undermine (or at least complicate) any attempt to increase direct bookings. If a property is still using pen and paper or other outdated methods to run their day-to-day operations, it makes it difficult for them to dedicate time to effectively utilizing their marketing and distribution technologies. It could be argued that streamlined, digital property management is the baseline for more advanced digital distribution activities. On the flip side of hotel technology trends are the reasons why some systems have not yet seen widespread adoption. The white paper provides some insights into this topic as well. When asked about the main obstacles they were facing in adopting technology, respondents identified “a variety of interrelated issues.” The most significant cited was cost, with nearly half (45%) of the independent properties indicating that they found systems to be too expensive. A significant number (40%) of independent properties simply lack the time to evaluate tools and solutions. Additionally, 35% of respondents admitted to not being aware of available options. They pointed out that only a small number of respondents (22% and 11%) cited technical challenges with systems as a blocker to adoption, suggesting a trend of hotel technology becoming more user-friendly and more easily implemented. The remaining barriers of money, awareness, and understanding might be behind the trend of many hotel technology providers focused on developing cost-effective, tailored solutions specifically for independent properties. All the data from the study can be found in the whitepaper Independent Properties in the Online Marketplace. Click here to access it for free. Experts from trivago and Phocuswright also discussed findings from the study in greater depth and detail in a recent webinar. Anyone who missed it still has a chance to watch the video replay here. Independent property owners, managers, and marketers interested in hotel technology solutions from trivago can learn more about its metasearch marketing tools here.